While painting a wall or a single room is something you can probably do on your own, jobs like painting the inside or outside of your entire home is best left up to professionals. This is because every year, countless homeowners are injured by falling off ladders or getting paint chemicals in their eyes while attempting to paint. This is perhaps the most dangerous do-it-yourself (DIY) job a homeowner can attempt to tackle on their own. 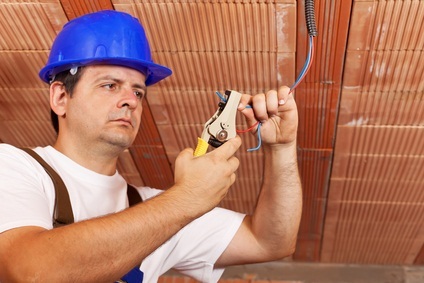 Installing or repairing electrical wiring is not as simple as matching similarly-colored wires and trust us when we say that one wrong electrical connection can result in fire or even death. Something as simple as hanging a ceiling fan in your living room or dining room seems like a perfect DIY job for a homeowner, but this isn’t the case. That’s because improperly installing a ceiling fan without enough additional support can send the fan flying off the junction box while operating at high speeds. Adding shingles to your home’s roofing structure should only be done by trained professionals for many reasons. Not only does a homeowner risk injury from falling off the roof, but not properly flashing the chimney and roof valleys can lead to extensive water damage from roof leaks, structural failure to your home and attic, as well as mold. There are countless DIY books which suggest to homeowners that they address water spots on drywall themselves. While the job itself does not pose much risk injury-wise, improper repair of drywall that has suffered water damage can result in mold and mildew growth behind the walls. At 911 Restoration our service technicians have over 35 years of experience restoration, home repairs and preventive maintenance. We can help you with water spots, mold, and even water damage from roof leaks so pick up the phone and call us today if you’re in need of assistance!